"The good old days"... With the Res2K it is now possible to enjoy the flair of 8-, 16- and 32-bit time as well as the beginnings of the 64-bit era again. 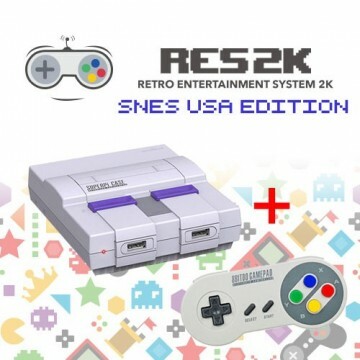 Super Mario, Crash Bandicoot or classic Final Fantasy parts as well as thousands of other games are reproduced with the Res2K with high-end performance. The player will not have to forego modern features either. You can save at any time or rewind the game at the touch of a button. This is the perfect game collection for retro fans and fans of real video games with classic flair. The Res2K is the ultimate retro machine for true enthusiasts. 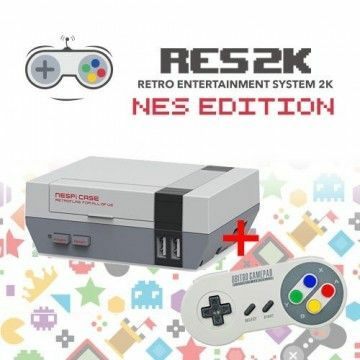 To sum it up, the RES2k combines more than 30 consoles. From the Atari 2600 and 7800 through the NES and SNES up to the first consoles of the 5th generation like the N64 or the Playstation 1. More than 12,000 gold pieces of the video game history were revised, adapted to the emulators of the console and still haven't lost a piece of their former attraction. Gamers with a heart for retro titles will find exactly what they are looking for, from Mario Bros. Classic to Mario 64, from the Gameboy's Final Fantasy Adventure to the world success of Final Fantasy VII. COMPLETE GAMELIST ABOVE IN A TAB. The Ready to Rumble package offers everything retro gamers need to play their gold pieces. The console is delivered in a high-quality NES case, which can only be distinguished from the original of the 80s in terms of design at second glance. In addition to the appearance, the quality of the workmanship is also convincing. Gap dimensions or unclean workmanship is an aberration that cannot be found here. With dimensions of 120 x 94 x 45 mm, the case will fit easily into any living room shelf. The scope of delivery includes the console, which is generously filled with games and the appropriate emulators, an HDMI cable and a high-quality 3A power supply. Also included is a free Retroflag USB Controller for plug and play. There are no complicated menus or settings. The RES2k has to be unpacked, connected before you can start right away. Everything is preconfigured and optimally adapted to the various emulators or the joypad. The Res2K relies on a Raspberry Pi 3B, which despite its compact design offers more than impressive performance. The emulators installed on the SD card are powered by a 1.2 GHz fast 64-bit Quad Core processor which is supported by 1 GB RAM and can be started in record time. Even the modern 64-bit generation games can be played absolutely smoothly due to the high computing power. At the same time, the Res2K can be easily connected to the home network using the WLAN module. Due to the 802.11 b, g and n standard, high bandwidths are possible. 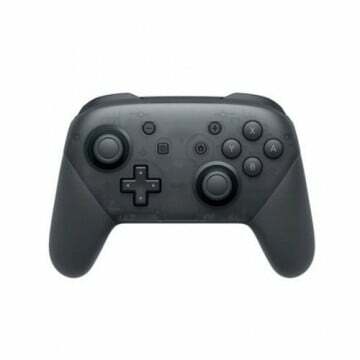 Controllers can also be connected to the console via Bluetooth 4.1. The low energy standard ensures a particularly long runtime for the gamepads. The connectivity options also offer a lot. Controllers can be wired to one of the four USB ports. 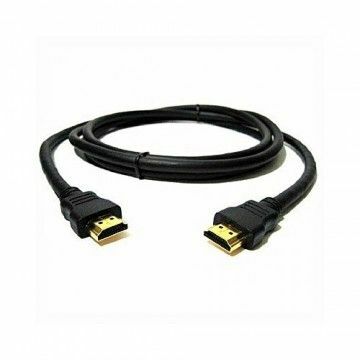 A 10/100 Mbit Lan connection and an HDMI port are also available. 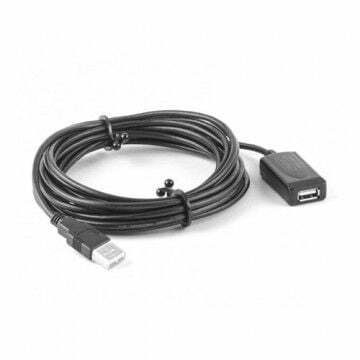 Audio signals can be transmitted via a 4-pin 3.5 mm audio/composite video OUT socket. A lot has happened in the video game industry over the last few decades. However, one thing has remained the same: playing with friends and acquaintances is more fun than playing alone. That's why the Res2K is "Ready to Play" by default for up to four players. With the integrated USB hub and Bluetooth support, you can connect more than one controller to the console at a time. Numerous "Goldies" are still unmatched in the field of multiplayers and will continue to inspire you. 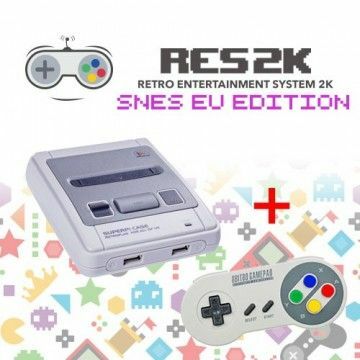 Whether Mario Kart, Mortal Kombat or Mario Party, there are plenty of multiplayer classics - and with the Res2K you can experience them all anew! Best of all, players do not even have to be in a room. Via NetPlay feature, friends can play together over the Internet. This is done completely uncomplicated and, as it is for the present time, with a stable connection - retro feeling is skilfully transferred to the modern with the Res2k. All consoles except the Playstation 1, PSP and N64 can be played with any controller. 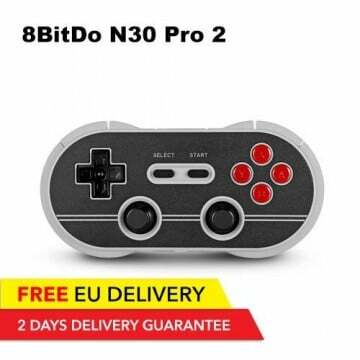 The Playstation 1, PSP and N64 need analogue sticks and they are only available on the 8BitDo N30 Pro, 8BitDo SF30 Pro and 8BitDo N64 Controllers. Yes, the pink retro glasses may obscure the perspective for the true quality of the games. But the fact is undisputed that the games of the 80s and 90s often showed much more flair and attraction than today's games. At that time the games had a high claim, they were not developed as a "Pay-to-Win" concept and were not the 192nd part of a successful game series, which sold its innovative power in favor of a better general compatibility to achieve higher sales figures. More and more shooters were sold, one had to buy the appropriate way with virtual blood duty and puzzled together with friends about the best possible approach to keep it as low as possible. If you're looking for the classics of video game history, the Res2K is the perfect solution for you! 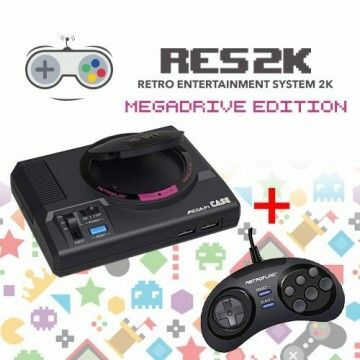 To sum up: The Res2K offers the video game experiences of the 80s and 90s in one console. 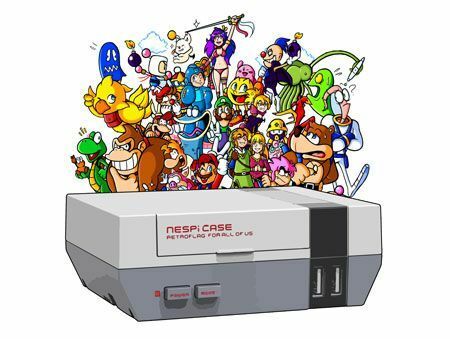 Supported Consoles SNES, NES, N64, Sega Master System, Sega Mega Drive, Sega CD, Playstation 1, PSP, Gameboy, Gameboy Adv, Gameboy Color, Atari 2600, Atari 7800, GameGear, NeoPocket, Apple 2 and more. Alles top Konsole klasse, Lieferung top, Kundenservice perfekt. Alle Daumen hoch. Alles Top - Vielen Dank - Bei Bedarf gerne wieder! Tolle Konsole schnelle Bearbeitung Die Konsole ist super macht Spass und die Lieferung war aus dem EU Lager auch in. Drei Tagen da. Dankeschön. Gaming Konsole RES2K Super schnelle Lieferung und die Konsole ist schon der Hammer. So viele Retro Spiele , da werden sich meine Enkel freuen wenn sie zu Besuch kommen. Die sind natürlich PSP4 verwöhnt, aber die alten Jump und Run Spiele, einfach genieal! Kurzum das Ding ist sen Geld wert. Die Lieferung war super schnell und die Konsole funktioniert bis auf ein paar N64 Spiele. Ich würde wieder bei trading shenzen bestellen ???? Das glauben wir eher nicht, das ist mit Recalbox gekoppelt. IN 2 Wochen,,, sorry, immer sehr schnell ausverkauft. Ja, C64 wurden entfernt, da diese nur mit Tastatur und Joypad spielbar sind und das bieten wir nicht an, deshalb haben wollen wir das beste Spielerlebnis und haben die Games rausgenommen. Notify me when the RES2k - NES Version - incl. 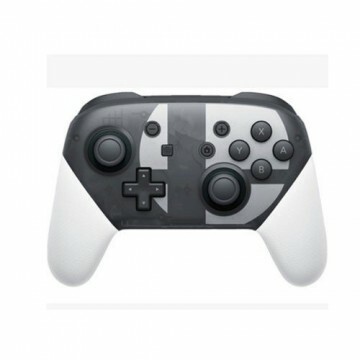 Retroflag USB Controller - EU Delivery drops in price.